Lifetime Achievement Award presented to Norm Oakvik, a founding member of North Star Ski Touring Club. On March 26, 2007, Minnesota Nordic Ski Association (MNSA) Lifetime Achievement Award presented to Norm Oakvik. The annual award is presented to a person who has spent their lifetime advancing cross country skiing in Minnesota. 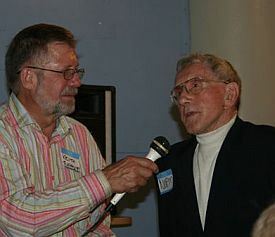 The 2007 award went to Norm Oakvik of North Minneapolis. Mr. Oakvik grew up in Minneapolis, the son of Norwegian immigrants. As a child, Norm’s parents fashioned skis for Norm themselves and taught him how to ski in Theodore Wirth Park. Growing up, Norm competed in cross country skiing, alpine skiing and ski jumping, and in 1952 Norm was the first alternate on the United States Nordic Combined Olympic Team. In the 1950’s and 1960’s Mr. Oakvik became a one-man sales team for all things cross country skiing in Minnesota. He coached cross country skiing throughout the area, organized races, constructed ski trails throughout Minnesota, and especially in Theodore Wirth Park, and, because there were no alternatives, he even imported cross country skis from Scandinavia, which he sold out of his living room. At the banquet it became obvious that Mr. Oakvik has had an impact that reached far beyond the Twin Cities area. People came from as far away as Bemidji to honor Norm’s spirit for cross country skiing. The 84-year-old Oakvik spoke of his appreciation for this new generation of skiers that have followed him. Norm still skis every day when there is snow available. MNSA’s Lifetime Achievement award is on permanent display at the Mora Nordic Center in Mora, Minnesota. A history of the North Star Ski Touring Club cannot begin without a few words concerning events prior to 1967-68, our first year of operation. In 1965-66, the the United States Ski Association formed a ski touring committee chaired by Norm Oakvik and then Bob Larson for the purpose of improving interest and participation in ski touring in the metro area and throughout the central division of USSA. Membership in that committee, besides Norm and Bob, included Jinny McWethy, John O’Bleness, James Rupert, and Dag Helgestad. A touring handbook was prepared and sent to forty interested parties. A two mile trail was cut near the Bush Lake ski jump and a schedule of eight committee sponsored trips was set up. The earliest organized NSSTC effort was at Jonathan New Town, as it was then known, north and northwest of Chaska. [It’s just “Jonathan” now, a pale imitation of the original development plan.] The owner, Henry McKnight, was a tour skier married to an ex-Olympic alpine skier. He gave the NSSTC the run of the unbuilt acreage of Jonathan and even loaned the club an old farmhouse for our club house. With Henry’s help and equipment, club members laid out and built a trail system that formed the last portion of the Victoria-Jonathan-Chaska Ski Race and Tour, the famous “VJC.” This was the first modern era (late 1960’s) ski-touring trail system in the Upper Midwest, as distinct from a few private or municipal cross-country courses used by high school teams and USSA Central Division competitors. 1967-1968: Some of the people who belonged to the USSA soon discovered that funding was not dependable and that they really wanted their own club, with control over our activities. So NSSTC was formed by three people who shared a vision-Bob Larson, Norm Oakvik and Jinny McWethy. At a meeting at Dwight Johnson’s house in the summer of 1967, nineteen members drafted a constitution and the North Star Ski Touring Club was born. Original committee members McWethy, Oakvik, Helgestad and Larson were joined by Shirley Esnough, Dwight Johnson and Lon Weidenhaft to form the nucleus of the new club. Lon Weidenhaft was elected the first president. Fifteen trips were planned including a ski clinic and USSA time trials.